Cappella Cantorum was co-founded by its original Music Director & Conductor, Barry B. Asch and Charter President Phillip Zimmerman, in January 1970. Cappella Cantorum emerged from the belief that a need existed for a continuing opportunity for the Lower Connecticut River Valley and Shoreline community to participate in the fellowship of choral singing. Following a performance of Britten’s Ceremony of Carols by choir members and friends of the First Congregational Church of Essex in December 1969, Mr. Asch and Mr. Zimmerman approached the augmented choir with the idea, and Cappella Cantorum was born. 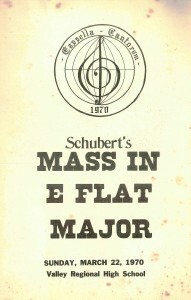 On Palm Sunday, March 22, 1970, Cappella Cantorum performed its first concert, Schubert’s Mass No. 6 in E flat major (D. 950) at Valley Regional High School in Deep River with 51 singers and an amateur orchestra. Wilma Brewer Asch served as Executive Director for the organization’s first 16 years. Mrs. Asch secured 3 consecutive grants from the State of Connecticut which helped to establish Cappella Cantorum and allowed the hiring of professional orchestras and soloists. True to its original intent, all of the Cappella Cantorum choruses welcome new members, without audition, who enjoy singing in concert. Our Mission Statement provides for community choruses whose primary purpose is to learn, perform and enjoy great choral music while striving for excellence and for enrichment of its singers and audience. To that end, it offers music education and coaching to improve sight-reading, understanding of music theory and vocal production. Voice classes with professional singers are offered twice a year and singers are encouraged to augment learning on their own with multiple available CD and online training tools. Please join us if you enjoy studying and performing choral music. We are a very congenial group and have a lot of fun singing. Plus, singing is good for you! Among the benefits are healthier lungs, increased confidence, release of stress, stage presence and, of course, positive emotional involvement. We especially encourage high school students and their parents to join us in making music together. Our wide mix of ages (from teens to folks in their 80’s), along with a marvelous blend of voices, make our singing together a most joyful experience. Adds to the quality of life in the area by adding to performing arts offerings. Provides an opportunity for study and performance of major choral works with professional orchestra, enriching the cultural offerings to audiences in the area. Encourages and supports area youth by often including high school choruses in rehearsals and concerts. Offers music education and coaching for members to improve sight-reading, theory and vocal production. Home-schooled young people have used Cappella Cantorum as their music course work. Supports the Cappella Cantorum Men’s Chorus, a popular group with audiences, singing a varied repertoire from classical works to spirituals and sea chanteys. Concerts are given in a variety of venues, including Connecticut Hospice and local senior citizens homes. Strengthens church choirs by providing significant additional training and experience. Has been invited to Carnegie Hall many times to join with representatives of other choruses from all over the United States to sing choral masterworks. Provides opportunities to sing in major cathedrals through Europe through International Tours—an effective people-to-people endeavor using the universal language of music. Through its participant-funded biennial excursions, the Cappella Cantorum International Tour Chorus has traveled to the United Kingdom, Norway, the Iberian Peninsula, France, Italy, Greece and Croatia. Sponsors “SummerSings Series” jointly with the Con Brio Choral Society. Open to all, at these programs choristers sight-read choral works directed by a variety of skilled conductors and accompanied by professional soloists. Gives singers the opportunity to participate through open registration, with no auditions required. Cappella Cantorum is made possible by the support of area businesses and professional people through program advertising, by generous sponsors, by our concert audiences, by our members through dues and hard work, and through the dedication and enthusiasm of our Music Director Simon Holt, Assistant Music Director Deborah Lyon and the efforts of the volunteer Board of Directors. Become a Sponsor, click here. Cappella Cantorum, Inc. is a 501(c)(3) non-profit organization.